Omar and Brandon Figueroa honored by city officials. 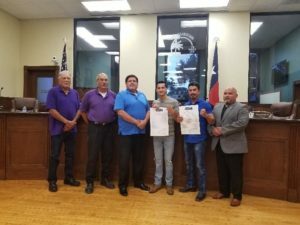 At a city hall meeting held on September 4th, Mayor Ben Gomez recognized and congratulated Omar Figueroa Sr. and his wife, Judith Figueroa on their success in training and motivating their sons, along with their service to the San Benito community. While the Figueroa family is from Weslaco, Mayor Gomez wanted to personally congratulate the boxers for their continued contributions to the San Benito area and its residents. The Figueroa boxers are frequently participating in school and local events throughout San Benito. “We represent the Valley,” Omar Figueroa Sr. said.